"I was at a very low point on the day I came to the ARS. They did everything possible to assist me and make me feel safe and that they were there to support me during my difficult time. Since then I have felt much calmer. I am indebted to them and am so grateful they were there." We are an employee benefit program that provides employees, eligible family members and retirees of member organizations with confidential and professional assistance in addressing personal concerns. Are you eligible? Do you work for, or are you a dependent of an employee of our member organizations? Check our members list. Recognizing a concern: you or your family member has a personal concern, or are seeking information on wellness or prevention. Reaching out: You can seek program information from an EFAP Representative at your workplace, or contact us directly. 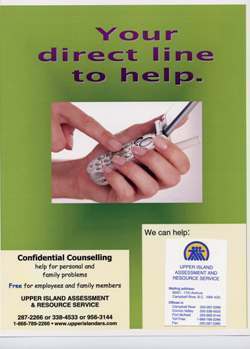 Using the program: Call to make an appointment with one our counsellors.